Disposable clear plastic dropper pipettes. 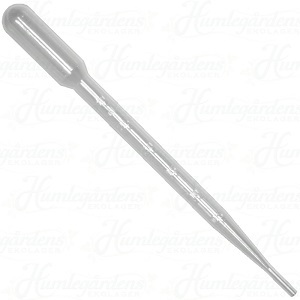 Each pipette can measure liquids up to 3 ml at a time. Pipettes are 6 inches long. Use them to measure liquids in ml. and to transfer small amounts of liquids from one container to another. They are convenient to use and are disposable, therefore no washing is involved, products are kept sanitary.